SOJ is the current keeper of the #GhostFlag and it will fly at NoToll tomorrow. What better way to start off the month of August. It will be glorious. BE THERE! DaVille will be hosting another first Thursday next Thursday August 3rd. Back by popular demand, we will start the evening with a friendly game of ultimate Frisbee at 6pm. Meet in the back teacher lot behind Atlee HS. We will play till around 7/7:15 then be heading to either Kreggers (9523 Kings Charter Dr, Ashland, VA 23005) or Marty’s (9357 Atlee Rd, Mechanicsville, VA 23116). 2.0’s and M’s are welcomed to join!! Hope to see you there!! The Ghost Flag will be at The Creek on Friday to send Abacus out in style!! Come get it boys!! Pre-Blast – A Last Hooray! F3RVA pax: Circle K’s father passed away last night. Please keep him and his family in your thoughts and prayers during this difficult time. Arrangements are as follows : Visitation will be Wed 7/19 @ Blileys Funeral Home on Augusta 6-9pm. Funeral will be @ 3pm Thursday at Our Lady of Lordes . Breaking Bread this Sunday….Need a Q! Who’s going to step up and do something that will make an immediate impact on another person’s life? If you dont know what’s up, give this a quick read: http://www.dailyplanetva.org/give-help/breaking-bread/ I need a lead HIM and a couple helpers for this Sunday July 23rd. You should plan a meal purchased or prepared, and plan to serve and eat with the guests. For details, call Lab Rat: 804-263-3570. ReeseStrong 5K is the weekend after the BRR. Contact Phonics for more information. 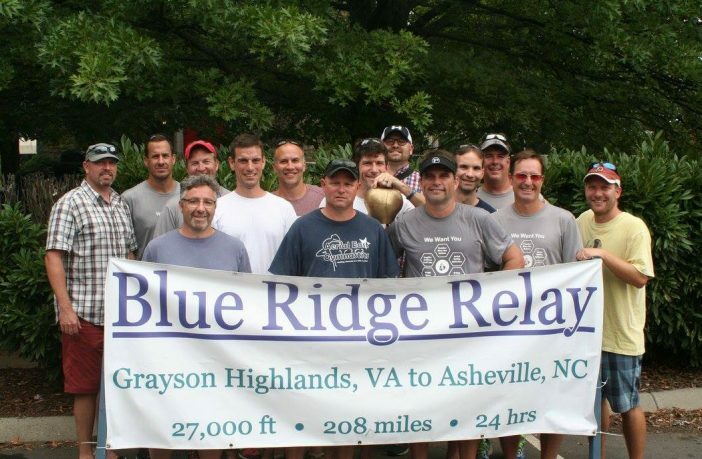 The Blue Ridge Relay is right around the corner. Sign up for an event you will never forget.